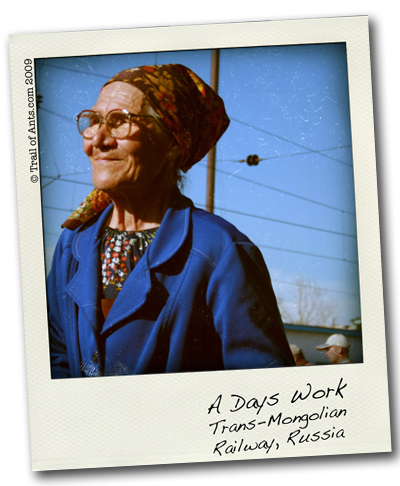 This weeks Reprint shows one of the beautiful entrepreneurs of the Trans-Mongolian railway. Many of the stations are located in seemingly forgotten corners of Siberia, so a string of cabins full of hungry punters is a splendid bonus. The station stops triggered animated clips of harmless haggling. As the tourists boarded the train laden with fresh tomatoes, dry fish, ramen, pickles and beer the ladies took a seat and counted their winnings. There was no love loss between the geriatric girls; if she sells pickles, and you sell pickles, everyone’s in a pickle to know which pickle to pick. I chose this image because I feel it captures the character of the lady brilliantly. You don’t have to have been there (buying her pickles) to cherish the moment. Next post: Can’t Stand the Heat?